Hey there. 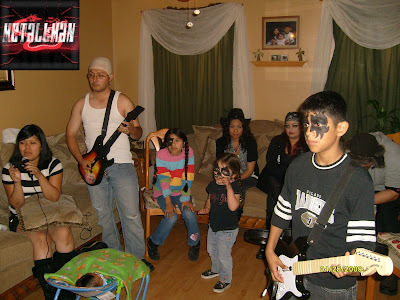 So this Saturday was our rock band / guitar hero night. My wife had asked everyone to come dressed up. Some people did, others didn't, but that was expected. We dressed up, of course. lol We never miss an opportunity to show a little creativity. We didn't go all out but just enough to make it fun. First off, I was a little upset that I could not find a white mask ANYWHERE. I went to Halloween shops, party supply shops, malls... nothing. So I had to improvise. Being Buckethead, I needed the white mask and a bucket so I just did the next best thing, painted my face white. While at the store, I decided to get black paint to get the kids in the spirit. 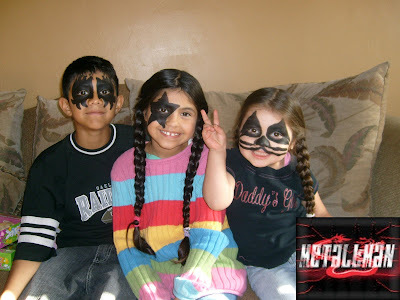 I figured I could just paint their faces as members of KISS and they're ready to go. My wife decided to change her persona at the last minute and went with the beehive wearing Amy Winehouse. First to arrive was our cousin, who came right from work so he wasn't dressed. He's a butcher so I told him he should have just brought his bloody apron and made up a name. No one would have questioned him. lol Soon after my compadre and his wife showed up as Maynard and Noodles. The guy looks hilarious in his bald cap. Miss B,"La Chica Dorada", and Donna member, Brett showed up shortly thereafter. We all got to playing and started laughing our asses off. Once the kids were in bed, the drinks started flowing, except for my wife, of course. No drinks for her. After many battles and songs, Maynard and Buckethead started to get into a heated showdown on who can sing Creep, by Radiohead better in Expert. Needless to say, if you're singing Radiohead, you're buzzing. lol I'm already getting questioned on when the next rock night is. I'll keep ya guys posted. Until then, check out some pics from the night. Later! Oh! I almost forgot. One of the highlights of the night was when we went out to get pizza. I pulled up to the pizza place and Maynard says, "Yo, Buckethead, you're forgetting your bucket!" lol I put my bucket on and jumped out the car and into the pizza place to order our pizza. lol Man, did we get all kinds of looks and I swear, the people thought we were there to rob the place. Instant classic! lol So if you were in the Long Beach area and thought you saw Buckethead ordering pizza, YOU DID!!! HAHAHAHA! Later! This looks awesome. I'm gonna have to steal this idea as it looks like it was a damn good time. You like like a shriner,lol! Nice! Comment spam? This is so great to see! Family time!